Designing a customer questionnaire for the first time (or even the 10th time) can be a time consuming and difficult process. Below are some free, and one paid, customer questionnaire design resources that we are providing to make that task easier. Every organisation that wants to build its business long term needs to listen to and act on customer feedback. 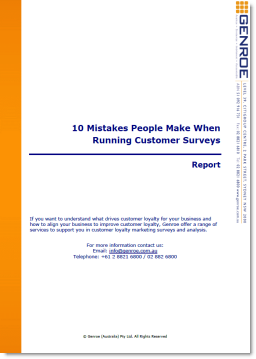 This need to capture customer feedback has driven many companies to develop and execute customer surveys. We talk to lots of people about Net Promoter Score and there are many mis-conceptions about it. So we put together this brief introduction to answer the questions we hear most often. How hard could it be? You want to know what customers want so just ask them a few questions. Actually, it’s not quite that easy and there are a few tricks and traps to collecting this information. Make the process of designing your customer questionnaire simple by using this sourcebook of proven questions. Through an extensive template list of sample and example questions it makes it easy to write your survey.